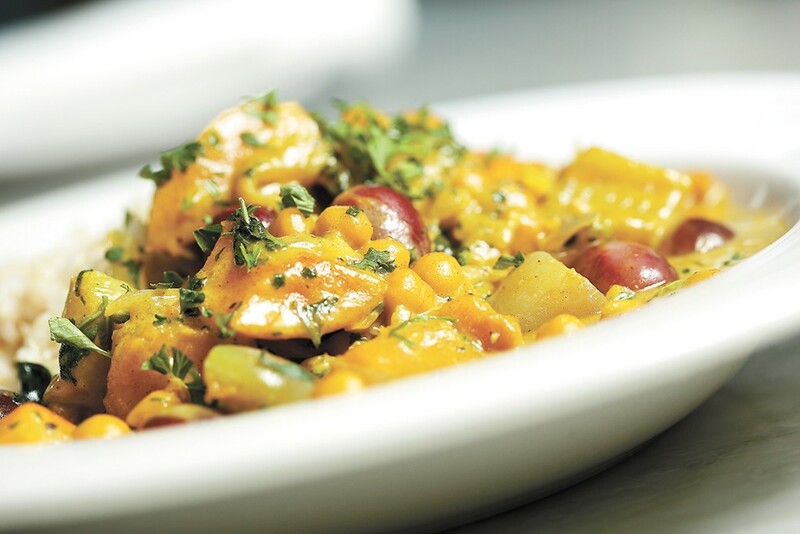 The chickpeas in Mizuna's Moroccan tagine are both flavorful and local. Washington (and North Idaho to some extent) is rightfully known for its apples, its wine grapes and its hops that make beer so delicious. But the legumes bountiful in the region are popular on restaurant menus, as more diners find them a tasty addition to (or substitute for) meat proteins. Lentils tie our area to cuisines from around the globe; while they've been grown commercially on the Palouse since 1937, farmers have increasingly found international markets like the Middle East open for business. Chickpeas have exploded in farm acreage as dishes like hummus have become go-to favorites for families. And peas and dry beans are vital components of dishes throughout the Inland Northwest. Mizuna opened 21 years ago as a vegetarian restaurant, and while founders Sylvia Wilson and Tonia Buckmiller expanded the menu to include fish and meat a few years later, they also stayed true to their original mission of featuring high-quality vegetarian and vegan options, even as they passed management of Mizuna to longtime employee Michael Jones in 2006. Among the tastiest of those options is the Moroccan Chickpea Tagine, an entrée on Mizuna's dinner menu that Jones says has been a popular item in the eight or so months since debuting. It's "kind of a staple," Jones says, a rewarding result of some kitchen experimentation. "I definitely wanted it to be sort of cardamom-and-saffron-based," Jones says, "so it was just finding things that go well and play well with those." Tender chickpeas are the dish's stars, with supporting roles given to roasted butternut squash, peppers, grapes, red onion and parsley over a bed of brown rice. In addition to the cardamom and saffron, Jones' kitchen amps the taste with cinnamon, coriander, turmeric, ginger, garlic, salt and pepper in a coconut-milk-based sauce that also includes some hints of parsley and mint. It's the kind of sauce that will have you making sure you get every last drop sopped up before the waitstaff takes your plate. Pair it with some chickpea falafel as an appetizer, and you have a serious feast rooted in Inland Northwest soil. Ethiopian food makes delicious use of all manner of legumes, making places like Spokane's Queen of Sheba a godsend for vegetarians and vegans (not that their meat dishes aren't just as delightful). Queen of Sheba's options include the Veggie Sambussa, a pastry filled with lentils, onions, garlic and cumin, and several entrées based in split peas or chickpeas. My favorite, though, is the Yemeshir Kik We't, a dish that owner/chef Almaz Ainuu makes with Washington red lentils cooked in Berbere, a classic Ethiopian spice blend that gives the lentils a spicy kick. But why settle for just one of Ainuu's incredible legume-based dishes — Ethiopian cuisine is perfect for a lunch combo served on the spongy injera bread used to grab the grub in lieu of forks or spoons. New to the Spokane dining scene, Cascadia Public House leans casual, but this vibrantly colored, flavorful burger deserves your attention for a lunch or dinner date. The Five Mile gastropub has a definite love for the region's vegetarians and vegans, thanks to chef and co-owner Justin Oliveri, himself a vegan. This burger's purple patty is a blend of quinoa, beets and pinto beans — one of Washington's most popular dry-bean crops. Served with butter lettuce, tomatoes, red onion, cilantro and vegan chipotle aioli on a local Alpine Bakery bun, it's a deeply satisfying option for burger lovers. A hot tip: The patty works great crumbled on a salad, too, if you're avoiding bread. The Inland Northwest might not be rife with Indian restaurants (yet), but the ones we do have know how to take advantage of the bountiful local crops available for their traditional dishes. At Spokane Valley's Top of India, you can get a samosa full of spiced chickpeas and Baingan Bharta, a smooth blend of eggplant and green peas. The place really shines when it comes to lentils, though, whether you stop in for dinner or their bounteous lunch buffet. My favorite is the Daal Makhni, a dark lentil seasoned perfectly and ideal for sopping up with some naan. It's hard to go wrong with the Tharka Daal, too, and its yellow lentils cooked in ginger, coriander, cumin and turmeric.